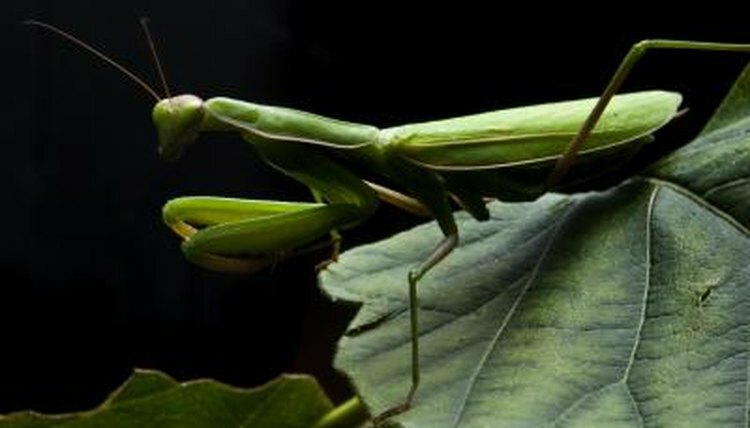 Praying mantises and other insects obtain oxygen much differently than vertebrates do. Rather than using blood to transport oxygen around their bodies, praying mantises use hollow tubes to draw air into their bodies and oxygenate their cells. Their respiratory system design probably limits their size. They lack lungs and they have green "blood." Praying mantises are predatory insects found in tropical and temperate environments around the world. Though they exhibit diversity in habitat preference and morphology, all are ambush predators of insects and small vertebrates. Scientists have documented 2,300 living species. Praying mantises use their strong forelegs to capture insects and control them while they use their small mouths to eat them. Like most other insects -- but unlike vertebrates -- praying mantises have discrete respiratory and circulatory systems. Rather than have combined circulatory and respiratory systems, with heart, blood and lungs transporting oxygen through their bodies; praying mantises rely on tracheal systems of tubes to provide oxygen to their cells. Because their circulatory fluid does not transport oxygen, it is termed hemolymph, rather than blood. Generally, hemolymph is clear with a yellow or green tint. Praying mantises have a series of small holes along the sides of their bodies. Termed spiracles, these openings introduce oxygen into their bodies. The spiracles open into structures called tracheal tubes. At the end of the tubes are small, thin and moist cells called tracheoles. The oxygen dissolves into the liquid of the tracheoles before diffusing into oxygen-depleted cells. Carbon dioxide -- a waste product of metabolism -- exits the body by diffusing in the opposite direction. Rather than inhaling and exhaling, praying mantises usually rely on the passive diffusion of respiratory gases. However, they can try to ventilate their tracheal systems by closing some of their spiracles and flexing their abdomens. When keeping a praying mantis as a pet, be sure to give him plenty of ventilation. A 10-gallon aquarium with a screened lid is a good option. Alternatively, completely screened enclosures supply even more ventilation, ensuring your praying mantis always has enough oxygen. Live Science: Why Aren't Insects Human Sized? What Kind of Animals Do Sponges Eat?